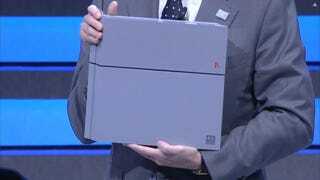 The 20th Anniversary PlayStation 4 looks spectacular. I'd certainly like to have one, but some people want one bad. So much so they're apparently willing to part with large amounts of cash for the limited edition hardware. GameSpot reports that the console, which is limited to only 12,300 units worldwide, sold out within minutes of going on sale on Sony's online store. On eBay, numerous resellers are auctioning off "confirmed preorders" for the console. Right now, all these resellers have to show are their email confirmations for the console, yet as noted on Inside, some of them are asking as much as ten thousands dollars. In one auction, the 20th Anniversary PS4 apparently went for over $15,000. According to CNET, another one apparently sold one for over $20,000. There are two words for that: Totally insane. Especially because today, Sony is selling the console at a bargain basement price of £19.94 (US$31) in London. PlayStation&apos;s nostalgic gaming boudoir aims to brings the queues to Bethnal Green Road.